Our paper sampler consists of 30 cut sheets of high-quality patterned paper, which is naturally wood-free and acid-free. The sheets are available in two different sizes and are ideal for all types of artistic applications: crafting, folding, writing, glueing, decorating, gift wrapping, making collages… the choices are endless! 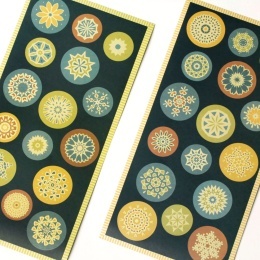 We offer our paper sampler as unit of 3 sheets per each of the 10 different pattern from the JACKIE and MARLIES series. 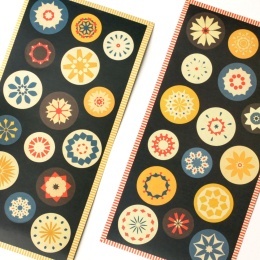 Dot stickers, matching our patterned paper from the ALMA series. Dot stickers, matching our patterned paper from the JACKIE series. 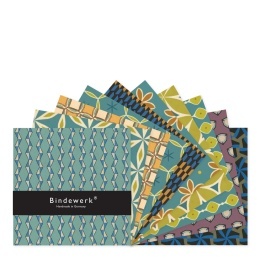 Beautifully patterned envelopes in a wide format made from papers from the ALMA and OLIVIA series. 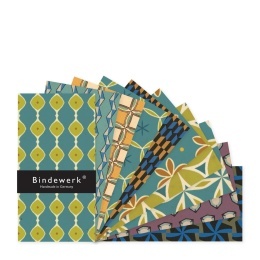 Assortment of patterned papers; available in two sizes.